In my last post I posted an image of Stearns Wharf at sunset. I think I mentioned that I was standing behind a restaurant near the end of the pier to take that picture. I thought it only appropriate to show you the restaurant in question, The Santa Barbara Shellfish Company. This is a HDR (3 bracketed images) processed in Photomatix. I decided not to “de-ghost” the flag as I wanted it to be fluttering in the wind. I thought I would take you back to California today. I think I mentioned in an earlier post that I just loved Santa Barbara so I wanted to share this shot of Stearns Wharf taken at sunset. Stearns Wharf is perfect for a stroll regardless the time of day but the evening was really a lovely time. This is looking inland but along the pier is a smattering of shops where you can get ice cream or pick up some touristy T-Shirts. I’m positioned right at the end of the pier behind the seafood restaurant. Before we hit LA we spent 2 days in Santa Barbara and I absolutely fell in love with the place. The beautiful harbour front, the quaint downtown area and the friendly people made me wish we were staying longer. I took this image of the harbour from the wharf while we were waiting to be seated for lunch. 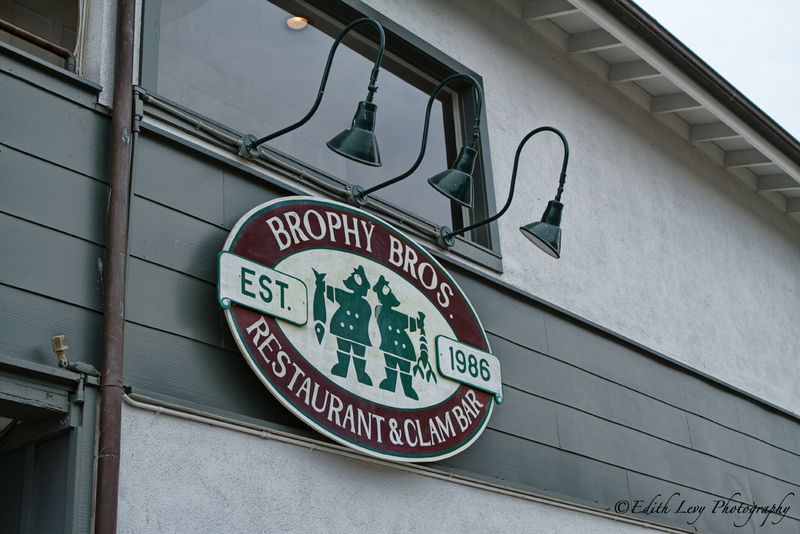 Speaking of lunch, if you’re ever in Santa Barbara you must go to Brophy Bros. After checking in to our hotel we asked at the front desk if they could recommend a good local restaurant. We were sent to Brophy Bros. I have to tell you the baked clams were the best I have ever had. And the oysters. And the shrimps. Ok…I’m making myself hungry and I really want to go back.